Teaching is different from other professions because your mental health affects so many different lives, lives who are truly vulnerable and dependent on you for growth. This places an extreme amount of pressure and stress on teachers, and if they are already predisposed to mental health issues, it can be a recipe for disaster. I used to teach with a woman who struggled with mental health issues. She didn’t tell me this right away, obviously. We worked together for a few years, and we became pretty tight. We would hang out after work, go out for dinner and drinks occasionally, and we became really good friends. She was older than me, more of a veteran teacher, and she really helped me get through my first few years of teaching. She offered good classroom management advice, and always had my back when it came to parents and administration. She was a lovely woman, so much fun and really intelligent. Her students loved her, and when she was feeling good she had the energy of a teenager! She would make her classes roar with laughter, but also have them so captivated by one of her stories that if you walked by her room when she was telling one, you could hear a pin drop. The way I found out about her struggles with mental health was by accident. One morning I heard her sobbing in her classroom. This was a serious sob, the kind where she was gasping for air because she was crying so hard she couldn’t breathe. At the time, our classrooms were all connected through adjoining doorways. Thinking something was horribly wrong, I peeked into her room to console her, and there she was, curled up into a ball in the corner of her classroom library, sobbing uncontrollably. I remember kneeling down beside her and holding her hand. She couldn’t even speak she was sobbing so hard. I just sat there and waited. I remember anxiously looking at the clock as the students would be coming in soon and wondering if she would be okay to teach. After a few minutes, she looked at me through the tears in her eyes and said, “Thank you. You are such a good friend.” The students came in shortly after that and she seemed to pull it together as I left for my classroom. I was worried and confused. She later told me she struggles with depression and that she is diagnosed with bipolar disorder. She was worried that she may be going through some things with her medications, but she assured me she was okay. After that day, her attendance became more sporadic, and when she did show up at work she was not herself at all. She often had the kids sitting in silence, working quietly or reading novels (she taught math though, so it was strange). By the end of the year, she was hospitalized, and my Principal at the time did not renew her contract for the following year. Unfortunately, my friend’s situation doesn’t seem too uncommon for teachers. In 2017, a poll was administered to 5,000 teachers and school staff across the country. The results showed that there was an increase in stressed teachers since the poll was last given in 2015. “In particular, 58 percent of respondents described their mental health as “not good” for at least seven of the previous 30 days. Just two years ago, that number was 34 percent.” This is according to The 74, the non-profit, non-partisan news site covering education in America. If the majority of teachers report that their mental health is declining, then surely, something may be wrong with the system. 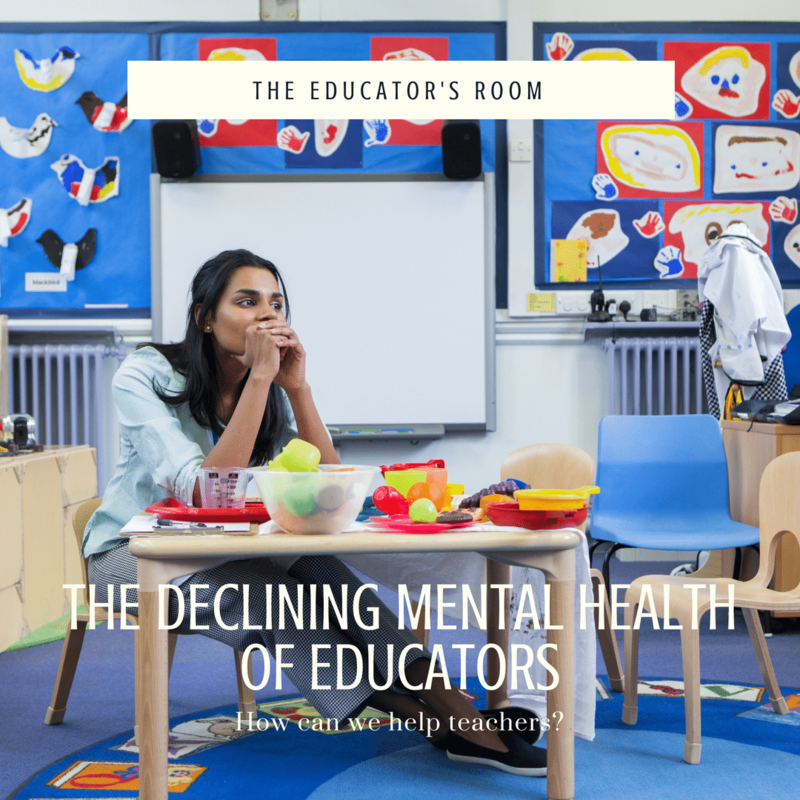 With the number of students in Education programs declining, and teacher turnover rates increasing, what can we do to help current teachers and their mental and emotional well being?